My spice girl sister sent me this. 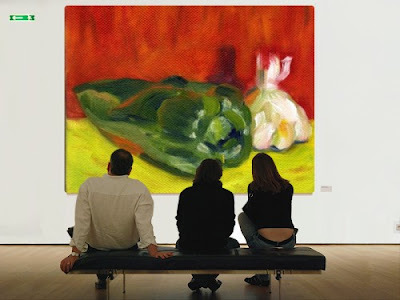 It is her spicy painting, a hot green pepper and some garlic. 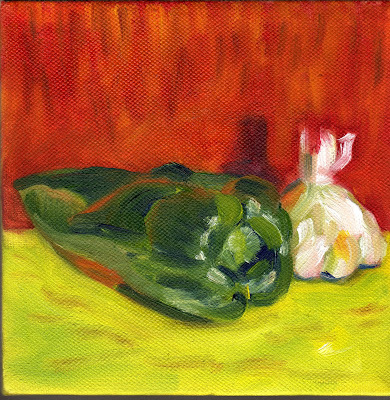 Leave me a comment, something spicy and the winner will receive this painting, which measures six inches by six. 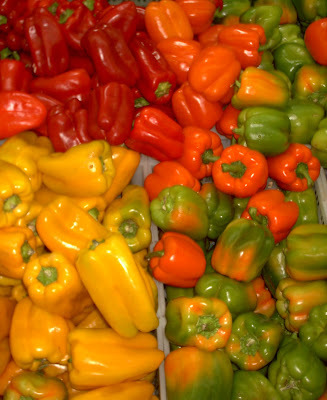 Tell me what peppers up your day? Are you a spice girl or guy? What adds spice to your day? 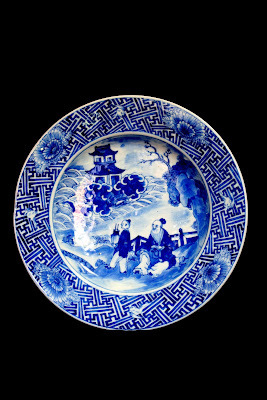 Chinoiserie images on china, the perfect blue and white plate to design a room around. Crisp, classic navy blue walls with white slip-covered furniture, are the perfect room to showcase a collection of blue and white porcelain. Borders of blue and white band a curtain and the edge of a plate. Last year I painted these tablescapes - for Absolutely Beautiful Things and came across them while I was organizing and thought I would share them with you again. 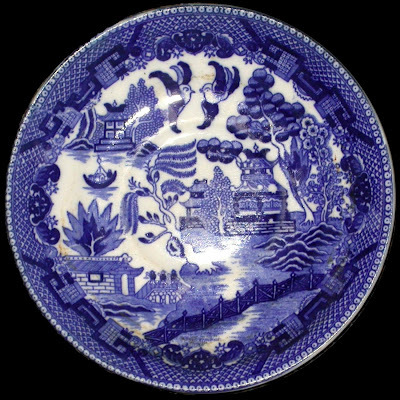 Somehow, I never tire of blue and white porcelain. Ginger jars, tea jars, boxes, vases, plates and textiles all looking as though they were gathered for a family reunion. 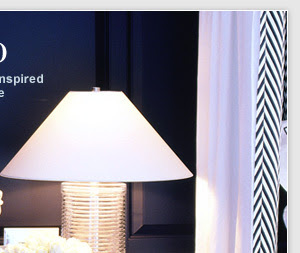 Immediately, images of Ralph Lauren and grand rooms appointed with blue and white come to mind. 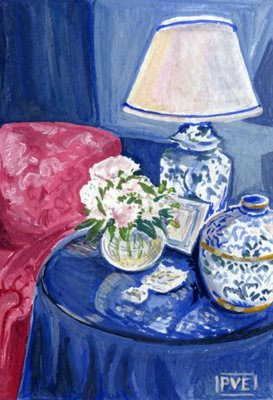 Having begun my design career at Ralph Lauren, it was a given that "navy blue and white" be in every collection. One of my favorite looks for Spring or Resort has always been the navy and white sailor top with white sailor pants. 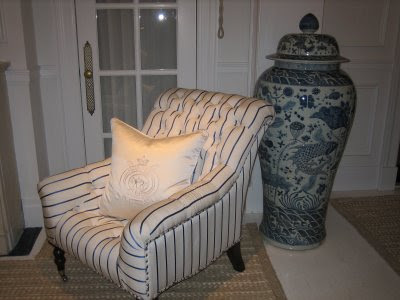 Ralph Lauren always seems to stay true to blue and white, the above image is from the Mansion via Habitually Chic. Heather recently posted on the shop. 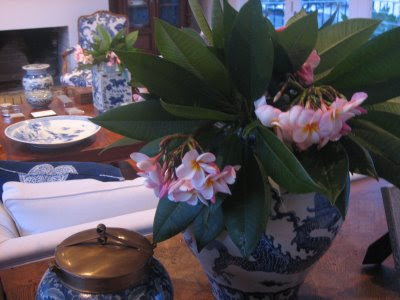 What a fabulous chair, and the chinoiserie vessel, they make quite the pair. Collecting all begins with the love of an object for color or design. Perhaps you have a signature collection. All you need to do is gather your collection in one spot and see it take shape. 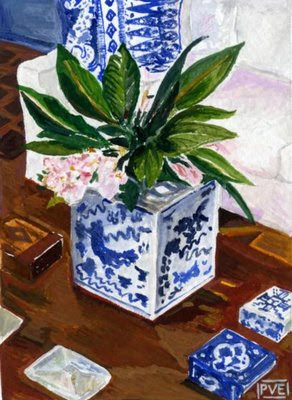 Do you have a love for blue and white? What do you collect? Please e-mail me a photo or post your collection. Perhaps I will be inspired to honor a collection with a work of art. Sunday is a day to slow things down and to give thanks and thought to the future week. One way to make plans for the week is to gather up all the loose change and roll the coins. Take them to the bank immediately and watch your savings accumulate. It is amazing how quickly coins can add up to dollars. Once you get in the routine of saving, you will be on a roll and work towards something full of grace. Do you have a proper piggy bank or a spot for loose change? What sort of amazing grace are you saving for? The art of storage is simple when you stick to one color! 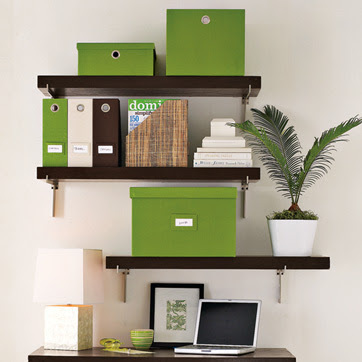 These great green organizing boxes are from West Elm and add zest to any shelf. Storage for magazines, boxes for files all clearly labeled or organized by color makes things easy to locate. 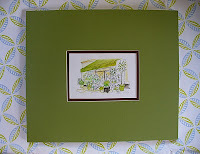 Breathe new life, "green life" in your home or office! Try to say ranunculus three times really fast. My most favorite flower from the "buttercup" family. Now - try to repeat what you love doing three times really fast. Do you have an idea that you are looking to plant. An idea to take shape. I know many of you out there are living with a seed, not yet planted, but oh so ready to nurture and to watch it grow into something beautiful. All it takes is one tiny seed to make an idea into a stunning bouquet. I encourage you to plant that seed, start small and watch it grow. Were you meant to teach,to design, to create, to share your love, your passion with another. Create your glory, all with a seed. What are you waiting for? fab friday - "at a clip"
Fab friday again! Speaking of things going fast, this week sure went by "at a clip." Lucky for me, I now am the proud owner of this snappy clip board. My collection of cool, stylish notes, clip board and mini journals! Thanks to this fab friday gal who I refer to as "Snow White" gave this to me. I had dropped a little hint of how I could truly benefit from that clip board. Just look how fab my birthday "to do" paper fits this clip board as well as the collection of moleskin journals. My kind of colors! beautiful brunch. The first time that I met Eddie, he immediately said, you are friends with "Seleta" and she is coming to New York for a weekend and we must get together. Well, alright, when Eddie talks - people listen. The brunch was simply lovely, quiche, fresh fruit, greek yogurt, mimosa's and a salad that was delightful! Eddie does it all with ease and a flair for fun. 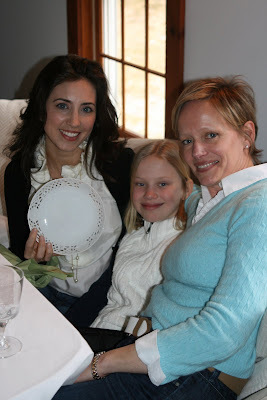 Seleta, my daughter Amelia and I "dishin" at Eddie's home sweet home. I hopped in my car and my little girl and I drove up to meet "Snow White" and her Prince Peter. Seleta is truly "quite the dish" - just beautiful inside and out! Seleta is holding a white dish that I just knew she would love. I bought it in Paris at open air flea market. One can always find loads of white dishes, and this dish had her name written all over it. A dish for a dish, and a clip for a clipper! Wishing each of you a fab friday! One of my most loved and cherished cookbooks is "The Eating in Bed Cookbook" - by Barbara Ninde Byfield, published back in 1962. A dear friend who knows me all too well, gave this wonderful book to me. She told me that the drawings reminded her of me and the witty sense of humor. There are two types of people, those that "love eating in bed"- and those who simply "loathe it." The cover is a simple blue and white ticking stripe, and the inside is full of incredibly witty and endearing recipes with endless possibilities for eating in bed or other unusual spots. Have you ever given any thought to "Eating in the bathtub" - being served "Turkish Delight" in a Turkish bath? It is after all such a heavenly sticky confection, surely a bath would complement this and avoid wasting any towels. Why one could simply enjoy getting sweet and squeaky clean right in the tub! Witty, clever sleep inducing recipes with visions of remnants left to be found in bed. Normally sticking to a regime and a hard and fast rule for eating at a certain hour, this cookbook advises wisely to the fact that one can eat in bed at any hour. There are a number or things that cannot be eaten in bed: Baked Alaska being one, based on the problem of getting this delicacy to you at a proper temperature without sacrificing the luxury and unhurried ease which distinguishes successful Eating in Bed from even the finest dining out. 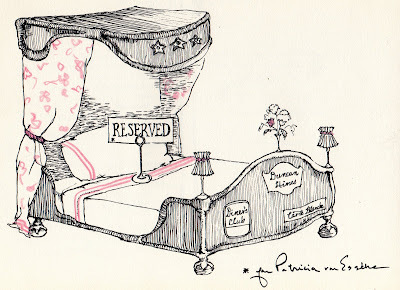 Perhaps one day restaurateurs should realize this unique service and accommodate even the most finicky of eaters with mouth-watering delights delivered straight to the comfort of one's bed. Reservations for the corner bed with the canopy, please. Do you enjoy cooking and eating in bed? Growing up in a family of seven children, daily bread was part of survival. Learning to bake and break bread was simply part of each day. Bread and butter is still considered a daily luxury. A dear friend gave me a subscription to Cook's Illustrated. Just look at this bread that she shared, a slice of heaven. I love anything illustrated to show me how to. I have always been big on directions with pictures. Another friend, Debra - asked me to share what's cooking and my cook books. So much of enjoying good food is not merely in the cooking, but in the artful presentation. Just look at this lovely Spring Salade Nicoise, tuna, lettuce, tomatos, potatoes, an egg, olives, green beans and top with a home made vinaigrette. 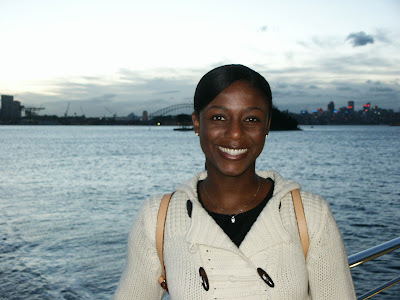 I know for many, that eating healthy can be a challenge especially if the process was not instilled at an early age. I was fortunate to have parents who built a produce business in 1945 and it is still thriving today. We had many a meal made from things that just were not worthy of selling. Many a fabulous meal, home made soup and bread. my kitchen shelf, above a doorway - the Joy is cooking is one of my favorite books. Simply streamline, stop buying processed food, buy organic, make or grow your own if possible. Spring time is a wonderful time to focus on all the healthy items from local farmer's markets. 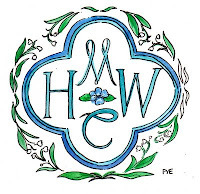 Peruse cookbooks and share on-line recipes with friends. Plant a garden and promise yourself to eat good food daily and break a little bread. 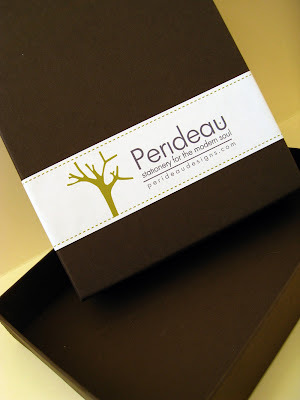 Perideau Designs is a lovely place to shop for simple, modern stationery. Working alone - designing, printing and assembling the products, she bounces ideas by her husband and her 17 month old daughter as well! 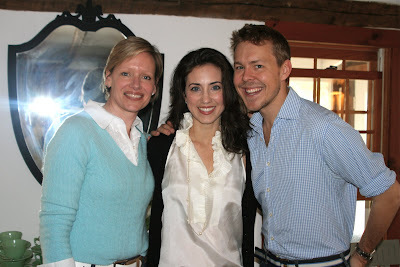 He provides incredible support to her, filling orders or helping to juggle the demands of her work and motherhood. Perideau style is simple, modern and uncluttered. She loves modern interior design, inspired by the latest edition "Dwell" magazine. The clean lines, muted palettes are seen in her streamlined designs. She finds her best time to work is very early in the morning, finding focus and no disruptions. One of her favorite sites to visit is "zen habits" from where she learned that "one can get so much done before the rest of the world wakes up." I love the early mornings too. 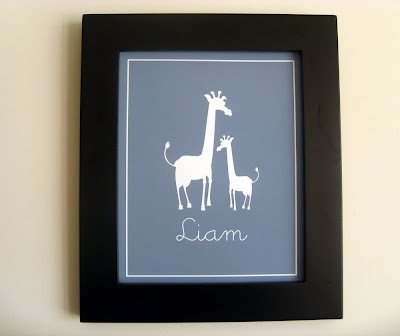 Her customers are women looking for stationery or party goods for their children or for personalized gifts for friends. She is constantly scouting to expand the perideau line. I must admit that when I spotted "Perideau" - I immediately thought that it was letterpress, but it is high quality ink jet printing. 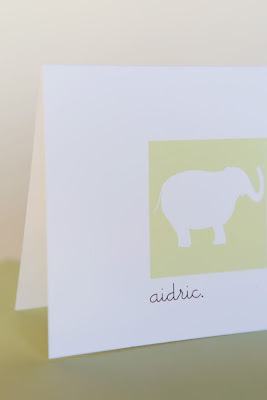 The line was born when she began searching for paper products for her daughter and she wanted a line that would cater to the innocence of childhood and the understated sophistication of the young at heart without being overly "cutesy." 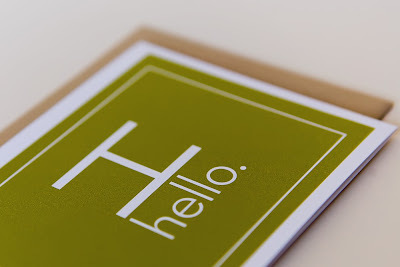 Please pop over here to "Perideau" - she has a lovely shop on etsy and a beautiful blog. I really love the modern simplicity not only for children but for any age. 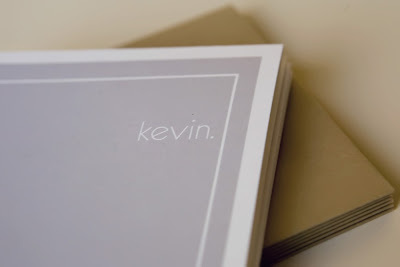 For as long as I can remember, I have always loved perfectly modern paper. When my daughter was little, and I would fetch her from pre-school, she would proudly run to me with her latest creation and tell me all about it. One of the projects that she made was to take a branch and wad yellow bits of tissue and glue them on to learn about this spring plant. I know I saved it in a big box. She told me it was called "For Cynthia" - which I loved how she made perfect sense of what she heard from her teacher telling her that is was "Forsythia." Our walk home would consist of "forcynthia" spottings and the awakening of spring. It is the times that we allow ourself to stop or to see things from another's perspective that our eyes are suddenly open to see. To those of you in the thick of raising wee one's or in the hopes of imagining spring, now is the time to look around, observe, contemplate all the glory in store. 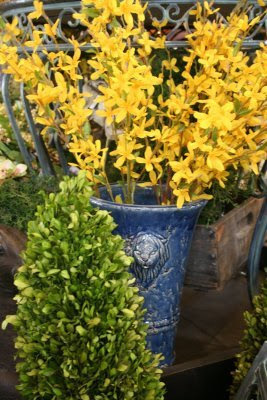 The forsythia is not yet in bloom (here) and I thank the kind soul for allowing me to borrow this photo of "faux forsythia." I am somewhat of a purist and enjoy the real thing, but in desperate measures I can bring in some "faux" to garner spring and little memories. Labels: spring time "for cynthia"
Every so often, a kind soul sends me a sweet something in the form of an e-mail with an attachment. 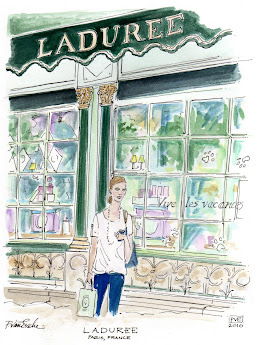 Often, it is an illustration with a comment something like this - "thinking of you and spotted this illustration which I thought you would like." "Like" - is an understatement, I love it! 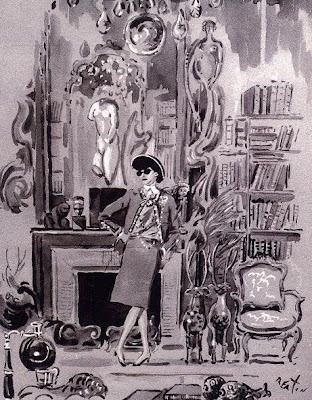 The above illustration of Coco Chanel by Cecil Beaton is so whimsical and although it is in black ink, it is full of color, of style and just simply so fun. Thinking of you and hope you have a wonderful weekend. Omiai is a Japanese custom where unattached individuals meet in order to arrange a possible marriage. I ponder this custom and wonder what might have happened if I were to be matched or arranged to lead to marriage. In a nearby village there lives a perfect match for me in a shop, SOHO east. A spot full of lovely things for the home, for the self or for the giving. So today, these lovely goodies are part of a giveaway, thanks to SOHO East. Simply leave a comment and tell me what you would look for in a mate. What would be 3 qualities to win you over. Order some sushi, pour some saki and enjoy your fab friday with your dream match made in heaven or share it with the one your with. Meet Paul & Jean. Paul wooed Jean. 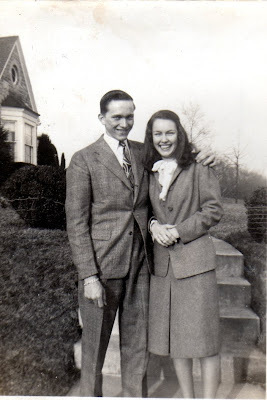 The courtship began with a "blind date" and swiftly they were in love and married. Seven children were born along with a family business. All still growing strong. Fast forward to now. Sixty years of marriage. Mom and Dad, you are the best. I love how you just keep on going, staying positive, perky, loving life and all that comes along. Just like a well made suit. Never out of fashion when it is well made, tailored to stand the test of time. I am a sucker for things like bound buttonholes and dressmaker or tailor details. You both suit one another so well and I admire you each day. My dear Dad still has the suit I helped select for him to wear nearly twenty years ago. Accessorized over the years to keep it fresh. Suits truly are a great investment. They stand the test of time. I wore a suit that belonged to my Great Aunt Louise on my honeymoon. A deep navy, a wool ottoman, and a sharp cut, and fab buttons and bound buttonholes. (Jacket by Marc Jacobs) This could be an easy vintage find, a jacket and vest. Spring is in the air, and the time seems right for a classic suit in a lightweight wool. Perhaps a texture, a pique pattern. I may not work in a corporate environ nor need a full suit but I do enjoy looking respectable every now and again with a simple suit jacket or a flat pencil skirt or classic suit trouser. 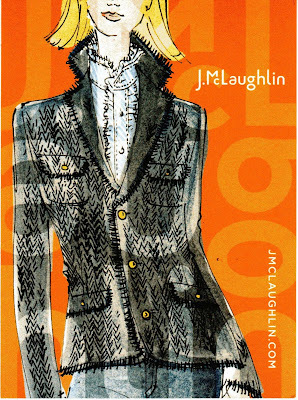 As I "shop my own closet"- I see old friends, secret admirers and suitors wooing me. What Spring suitor is wooing you? Does an interview require a suit? Love your thoughts? 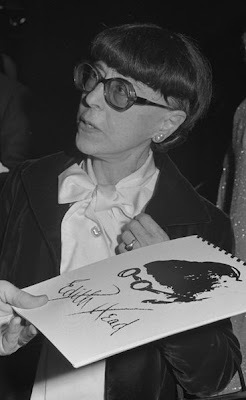 Edna Mode (from The Incredibles) and Edith Head ( An American Costume designer) are incredible women in my book. Look how much they have in common. 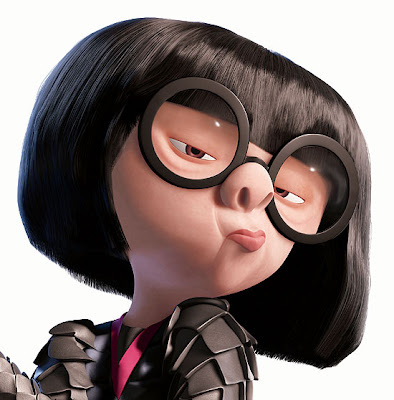 Both gals known for the chunky frames and the flat bangs. Ageless and timeless chic. Hope each of you know how incredible you are to me. What's your trademark that makes you incredible? Thought each of you would get a chuckle out of this sign which pretty much sums up today. Yes, my birthday is today, and I am not even one wee bit Irish, well, I do have a son with reddish hair, does that count? 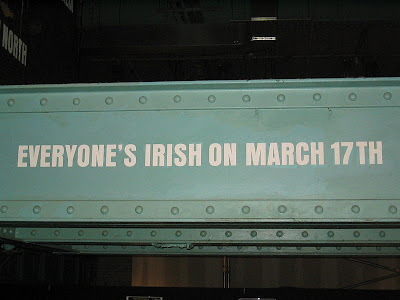 It is St. Paddy's day, and "Everyone's Irish on March 17th." Join me as I wear a little green, do a little jig, parade in a little parade and maybe even sip a little green. Green tea sounds nice. Thanks for all your bloggy birthday wishes! Lucky me, I found this four leaf clover, the four petals stand for luck, love, faith and hope. Consider this a twist of fate, a fortuitous find or just pure luck. 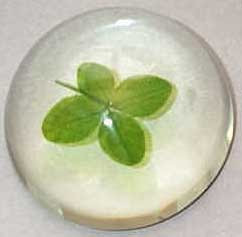 I must admit, when one finds a four-leaf clover, one is compelled to save the specimen - to protect it and to consider it pure luck. A lucky scroll and a wee lucky package. I love hunting for four leaf clovers. It is when you are not looking that you find them. Well, several months ago, not even looking, a certain lady luck sent me such kind words in the form of an e-mail, then a package, not one but many. Each one that arrived, was like finding a four-leaf clover, leaving me feeling that things in life happen for a reason. We learned that we were connected by our love for art, and a love for a certain person, not just any person mind you but someone of stature and grace. A worldly woman who might come across as a tad bit intimidating with her demeanor and her wealth of life. A Grande Dame if you will. She lived a life of grandeur, a life of luck, that said, not without sadness or hardship. We consider ourselves lucky to have known her and to have been a part of her life. A life-scape is created by living and experiencing, life, birth, joy, and death. Meet artist, Debra, she commemorates life in her artwork, or her "Life-scapes." I can think of many who would love a gift like this to celebrate an occasion or to remember all the living in this fast life. 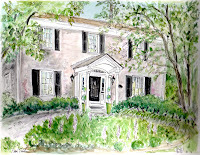 Debra is an artist, a mother, a young grandmother, a gardener, a cultivator and has a green thumb. She has many talents to share. Do you believe in luck? Is there a super-natural power that has connected you to someone. I think daily of how each of us are here, connected, some lucky and some not so lucky. My friends - this is the reason we are here, to connect, to share and to give freely. The more that we give - we live more openly and we connect with others who have ways of touching us, moving us, and inspiring us to live a good life. 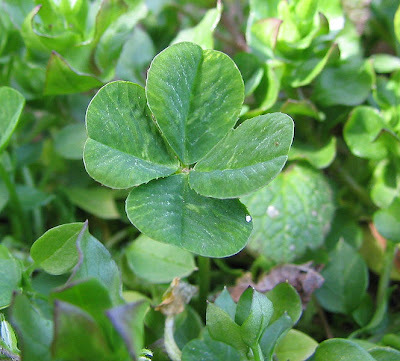 There are challenging times for many and if we each share a little luck, we will all find more luck. Do you believe in "luck?" Leave a comment for good luck. This week is all about luck.